My card today is my Day 18 colouring for Kathy Racoosin`s 30 Day Color Challenge! I finished the larger flower on Saturday and adhered it with foam tape for some dimension. It is not too late to play along, all the details for Kathy's challenge can be found HERE on her blog The Daily Marker. My daughter arrives back home tonight! Sunday morning she was flying from Athens back to Rome and then from Rome direct to Toronto. She should be getting home around 8:00 pm local time. We are so excited to see her! Absolutely lovely Tracey. I love the doodled flowers and how you colored them. I know exactly what you mean when you say Copics can be scarey. I agree, I get intimidated at times by them. Love this so much Tracey!! The die cut flower is beautiful. The white edges really make it POP off the card! Beautiful card. I love and long for the doodled flower set. Love the way you have used them here. Your doodled flowers turned out great, Tracey. Also love your umbrella card. I can imagine you're thrilled your daughter will come home today. Funny to think she was only a short flight away from me, since I live in Crete. The only time I visited Athens was when we had to renew our passports at the Dutch embassy a litle over a year ago. Can't wait to see a few pics from Brooklynn's trip! Love your gorgeous color...rich stunning colors. These colors are so pretty! Love those doodled flowers, too. Gorgeous card! I think those doodle flowers are perfect for combining lots of colors and love the ones you've chosen, Tracey. So clean and crisp! Love your card, Tracey! Glad to hear your little chick is returning to the nest soon! Amazing stamp set for this doodling card, Tracey.. really awesome job of colouring, too. I think you are just all around amazing my friend. I know you're loving having Brooklyn home! Such pretty coloring. I bet you can hardly wait for your daughter to get home tonight and hear all about her trip. I love your coloring of the flowers! Gorgeous!!! Just beautiful, Tracey! Your coloring is fabulous and these flowers are gorgeous! sooo pretty Tracey. Love the colors! sooooo, so pretty! gorgeous coloring on those gorgeous flowers. 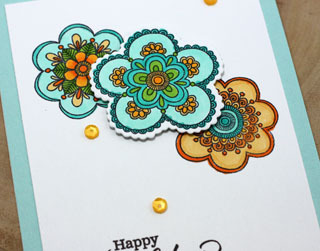 Beautiful and bright , love this card Tracey! Happy for you your girl is home. Thanks for your sweet comment about Dee. You did an AMAZING job coloring these flowers, Tracey! 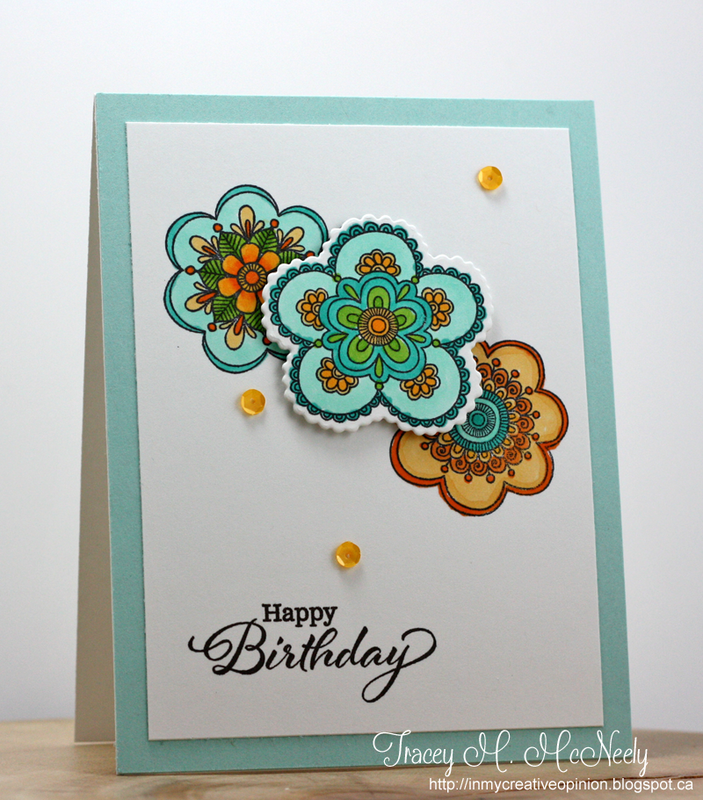 Great idea to use the doodle flowers, and the color combo is beautiful! Wow--those doodled flowers really shine when they are colored so well. You picked fantastic colors to use, and love your card design, too. So, so pretty, Tracey! Love your color choices, and the lift of the center die adds such great texture! Beautiful doodled flowers, Tracey! Your coloring looks fantastic! I know you are thrilled to have Brooklyn home. Did you both stay up all night talking!!! Gee-orgeous! Wowza this is a stunner. I'm sure that it can be frustrating to not be able to make your hands do what your brain wants it to do. I have that problem without MS! Sending hugs and letting you know that your work is amazing - just like you! Tracey, I'm thrilled that even though you find colouring a challenge, you step right up to the plate and persevere! Net result: dazzling doodles! Your choice of colours, your actual colouring and your overall card: work of art! Love this - and love how you inspire all of us to stretch ourselves in whatever ways we can!